Hula Dog Hawaiian Style Hot Dogs (formerly Puka Dog) began as a little stand on the remote west shore Kekaha/Kauai in 2000. For the next two years using Dominique’s culinary expertise , we took a simple, somewhat forgotten staple food, the “hot-dog” or “sausage” and completely revolutionized it. Taking from the tropical and beautiful surroundings, we began sampling and, eventually concocting, mouth-watering relishes and secret sauces from tropical fruits and plants native to Hawaii. With the additional flavor of a choice proprietary sausage and fresh baked bun made with all natural ingredients, we have created a one-of-a-kind, full experience that generates return traffic regularly, native and vacationers. In May, 2002, we opened our new shop in the Poipu Village Shopping Center offering this newly developed Hawaiian Style Hot Dog. During the next few years we continually improving the products and processes. Poipu is a hot spot for vacationers and executive business travelers. We are enjoying the ever-increasing interest and passion for this new, unique, Hula Dog. On July 2007, Hula Dog opened its first store in the Island Of Oahu locate in the International Market Place Waikiki. With a simple menu the new store has been a big success. On October 2012, Hula Dog open its door in the Downtown Honolulu at Bishop Street ( Side of HPU Building). December 2013, Hula Dog open a trailer in Hale’iwa North Shore. A mix of Hawaii grown, wholesome products, and French Cuisine Secrets. 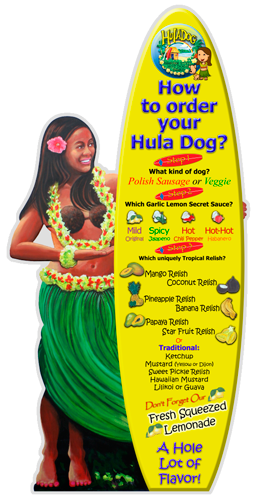 Hula Dog Hawaiian Style Hot Dogs, built Wahine Brand Corporation in 2007 in the island of Oahu. We cook small batch quantities of mouth-watering Garlic Lemon Secret Sauces, Tropical Relishes and Hawaiian Mustards from plants and fruits Hawaii Grown.Wahine Brand Corporation, under the direct ownership and leadership of Hula Dog is the exclusive supplier for all Hula Dog and Puka Dog Stores and the web site Hula Dog Hawaiian Style Hot Dogs. Our mission is to continue to find more unique flavors to please your palate and take your mind away to our home, Hawaii.